This page may be outdated and requires review. There is currently no official installer available for Windows. However, there are a number of easy solutions. Enter password for the user. There are a number of third-party utilities which aim to address this issue. 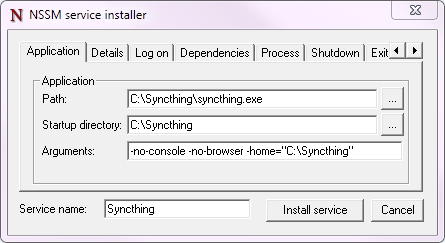 These typically provide an installer, let Syncthing start automatically, and a more polished user experience (e.g. by behaving as a “proper” Windows application, rather than forcing you to start your browser to interact with Syncthing). Windows GUI Wrappers, Cross-platform GUI Wrappers. Starting Syncthing on login, without a console window or browser opening on start, is relatively easy. Right-click the file and choose Edit. The file should open in Notepad or your default text editor. Click Start, click All Programs, then click Startup. Right-click on Startup then click Open. There are important security considerations with this approach. If you do not secure Syncthing’s GUI (and REST API), then any process running with any permissions can read/write any file on your filesystem, by opening a connection with Syncthing. Therefore, you must ensure that you set a GUI password, or run Syncthing as an unprivileged user. With the above configuration, Syncthing only starts when a user logs on to the machine. This is not optimal on servers where a machine can run long times after a reboot without anyone logged in. In this case it is best to create a service that runs as soon as Windows starts. This can be achieved using NSSM, the “Non-Sucking Service Manager”. Note that starting Syncthing on login is the preferred approach for almost any end-user scenario. The only scenario where running Syncthing as a service makes sense is for (mostly) headless servers, administered by a sysadmin who knows enough to understand the security implications. Download and extract nssm to a folder where it can stay. The NSSM executable performs administration as well as executing as the Windows service so it will need to be kept in a suitable location. Set Path to your syncthing.exe and enter -no-restart -no-browser -home="<path to your Syncthing folder>" as Arguments. Note: Logging is set later on. -logfile here will not be applied. Optional: Set Startup type to Automatic (Delayed Start) to delay the start of Syncthing when the system first boots, to improve boot speed. Enter the user account to run Syncthing as. This user needs to have full access to the Syncthing executable and its parent folder, configuration files / database folder and synced folders. You can leave this as Local System but doing so poses security risks. Setting this to your Windows user account will reduce this; ideally create a dedicated user account with minimal permissions. Optional: Change priority to Low if you want a more responsive system at the cost of somewhat longer sync time when the system is busy. Optional: To enable logging enable “Console window”. To ensure Syncthing is shut down gracefully select all of the checkboxes and set all Timeouts to 10000ms. Set Restart Action to Stop service (oneshot mode). Specific settings are used later for handling Syncthing exits, restarts and upgrades. Optional: To enable logging set Output (stdout) to the file desired for logging. The Error field will be automatically set to the same file. Optional: Set the rotation settings to your preferences. Start the service via sc start syncthing in the Command Prompt. Connect to the Syncthing UI, enable HTTPS, and set a secure username and password. Follow the information presented by brew to autostart Syncthing using launchctl. Download and extract Syncthing for Mac: https://github.com/syncthing/syncthing/releases/latest. Copy the syncthing binary (the file you would open to launch Syncthing) into a directory called bin in your home directory i.e. into /Users/<username>/bin. If “bin” does not exist, create it. Open syncthing.plist located in /etc/macos-launchd. Replace the four occurrences of /Users/USERNAME with your actual home directory location. Copy the syncthing.plist file to ~/Library/LaunchAgents. If you have trouble finding this location select the “Go” menu in Finder and choose “Go to folder…” and then type ~/Library/LaunchAgents. Copying to ~/Library/LaunchAgents will require admin password in most cases. Note: You probably want to turn off “Start Browser” in the web GUI settings to avoid it opening a browser window on each login. Then, to access the GUI type 127.0.0.1:8384 (by default) into Safari. Launch the program ‘Startup Applications’. command = /path/to/syncthing/binary -no-browser -home="/home/some_user/.config/syncthing"
The file is located at /etc/supervisor/supervisord.conf (Debian/Ubuntu) or /etc/supervisord.conf . systemd is a suite of system management daemons, libraries, and utilities designed as a central management and configuration platform for the Linux computer operating system. It also offers users the ability to manage services under the user’s control with a per-user systemd instance, enabling users to start, stop, enable, and disable their own units. Service files for systemd are provided by Syncthing and can be found in etc/linux-systemd. You have two primary options: You can set up Syncthing as a system service, or a user service. Running Syncthing as a system service ensures that Syncthing is run at startup even if the Syncthing user has no active session. Since the system service keeps Syncthing running even without an active user session, it is intended to be used on a server. Running Syncthing as a user service ensures that Syncthing only starts after the user has logged into the system (e.g., via the graphical login screen, or ssh). Thus, the user service is intended to be used on a (multiuser) desktop computer. It avoids unnecessarily running Syncthing instances. Several distros (including Arch Linux) ship the needed service files with the Syncthing package. If your distro provides a systemd service file for Syncthing, you can skip step 2 when you setting up either the system service or the user service, as described below. Create the user who should run the service, or choose an existing one. Copy the Syncthing/etc/linux-systemd/system/syncthing@.service file into the load path of the system instance. Create the user who should run the service, or choose an existing one. Probably this will be your own user account. Copy the Syncthing/etc/linux-systemd/user/syncthing.service file into the load path of the user instance. To do this without root privileges you can just use this folder under your home directory: ~/.config/systemd/user/. Systemd logs everything into the journal, so you can easily access Syncthing log messages. In both of the following examples, -e tells the pager to jump to the very end, so that you see the most recent logs. If you enabled the Ignore Permissions option in the Syncthing client’s folder settings, then you will also need to add the line UMask=0002 (or any other umask setting <http://www.tech-faq.com/umask.html> you like) in the [Service] section of the syncthing@.service file. If you are asked on the bugtracker to start Syncthing with specific environment variables it will not work the normal way. Systemd isolates each service and it cannot access global environment variables. The solution is to add the variables to the service file instead. This will create an additional configuration file automatically and you can define (or overwrite) further service parameters like e.g. Environment=STTRACE=model.